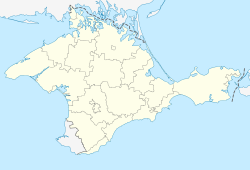 Armyansk (Ukrainian: Армянськ, Russian: Армянск, Armenian: Արմյանսկ, Crimean Tatar: Ermeni Bazar) is a town of regional significance in northern Crimea, a territory recognized by a majority of countries as part of Ukraine, but de facto under control and administration of Russia. Armyansk serves as the administrative center of Armyansk municipality, one of the regions Crimea is divided into. It is located on the Isthmus of Perekop. Population: 21,987 (2014 Census). Armyansk was founded at the beginning of the 18th century by Armenians and Greeks, who had come from the nearby city of Or Qapı (modern Perekop). The first name of the town was Ermeni Bazar (Crimean Tatar for the "Armenian market"). In 1921, it was renamed Armyansk. On 2 March 2014, early in the 2014 Crimean Crisis, a checkpoint was set up in Armyansk by Russian Naval Infantry units without cockades or rank insignia. They check cars driving in and out of the Crimea region. The Soviet monument of T-34 in the city commemorating the liberation from the Nazi occupation. The main employer in the city and the area is Crimean Titan (Russian: Крымский Титан ; Ukrainian Кримський Титан ), which specializes in the refining of Titanium dioxide for use in paints, plastics, and other products. In ancient times, the city was located on the important road to Crimea. Now this road connects Kherson Oblast to Autonomous Republic of Crimea . The town has also a railroad station. The murder of the Jews of Armyansk during World War II, at Yad Vashem website. Wikimedia Commons has media related to Armyansk.